Customized can coolies give you a unique way to keep your favorite drinks ice cold in the summer heat. Your custom can coolie is both made with premium 1/8" thick high density, open cell foam but soft and flexible allowing you to collapse your new coolie for easy transport. 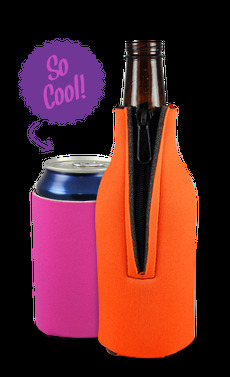 Designed for common 12 oz cans and containers, this koozie is great for a wide array of events at an unbeatable price.